One of the many common problems on the newer GE refrigerators is that the chilled water dispenser quits dispensing water, chilled or otherwise. Next, test the voltage to the blue side; should get 120 volts when water on door is activated. If you don’t, then you have to troubleshoot that circuit to find out what happened to the voltage– that’s a story or another post. The more interesting question, however, is, “What does it mean if you DO have 120vac at the blue valve coil?” Does it automatically mean that the valve is bad? Not necessarily, Grasshoppah. Photo courtesy of Sublime Master Hvacdrd. You can buy the dispenser heater kit here. This entry was posted in Refrigerator Repair on January 25, 2009 by Samurai Appliance Repair Man. I have GE fridge model GSS25KGSACC. Saddle tap valve wasn’t a problem. Water lines in the fridge were not freezing. I ordered a water inlet valve but that did not fix the problem. I diagnosed the problem to be the Filter Assembly and Tube (part # WR17X11618). Replaced it and that fixed my issue. Apparently the older Filter Assemblies can get gunked up pretty easily. Hope this helps someone! 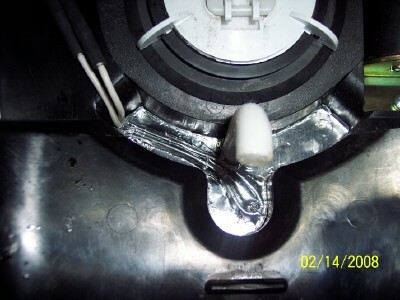 You can verify if the line is frozen by inserting a thin stranded piece of wire up into the the dispenser nozzle , or something flexible so as not to damage the the plastic tubing inside.The blockage usually occurs a few inches into the machine and you’ll feel the resistance of the ice. I turned off the refrigerator and used a hair dryer around the water dispenser both on the inside and outside of the machine for about 5 minutes. Inserting the wire now and then eventually breaks up the ice. The ultimate fix would be installing the heater kit to cure the problem though. great advice got ours working!! even though may be for just awhile. Has anyone ordered or installed the heater strip? Did it come with good instructions? where to hook the leads?